His name may imply otherwise, but this guy is a chill, calm dog! Good with cats and dogs and kids. He is quite relaxed in his foster home. He has just been in Canada for a few days, and he is taking it all in! When he wants a time-out, he will go hang out in his crate. 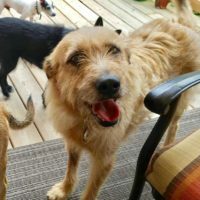 He can be shy at times and isn’t sure how he feels about walks, but he does like a secure yard to hang out with his pals and people. Very affectionate and intelligent and handsome young man!